It has been rather quiet on the forgery front recently with no Diamond Jubilee Machins, nor the new red ones. But the forgers have turned their attention to something much easier - the Olympic/Paralympic definitive. 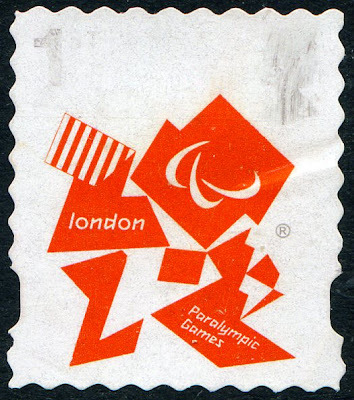 My thanks to Richard P for sending this scan of a Paralympic 1st class stamp which is an obvious forgery - the die-cut perforations are similar to some of those which were used on 1st class gold stamps. It's not clear why the grey printing of the value and Queen's head has been disturbed, this may have occurred during soaking. But this design is a much easier one to copy than the Machin, having no security features. We don't know whether the Olympic version also exists. It's no surprise that the 'other' stamp has also appeared. 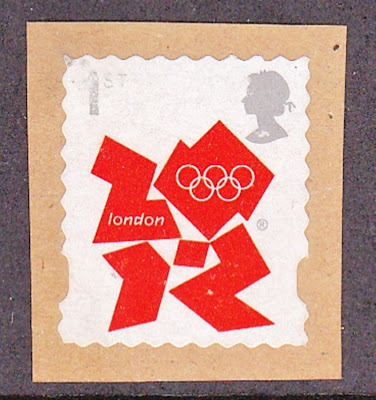 Thanks to Paul F for this image of the Olympic stamp. Paul writes: I noticed while handling it the silver* does rub off. A different die-cutter has been used on this one in that (even inverted) the corners don't match. Paul describes this as silver, I referred to it on the Paralympic stamp as grey - I am surprised to see that in the SG Concise the colour of the original is listed as black! !